I'll put the last three days of pictures below, but first I think having the cover on this seed starting kit may not be a good thing. I had heard in a another videos on YouTube that using the cover can cause mold (fungus) to show up on the soil. I see a couple of little spots of that. So, I am taking the cover off during the day and putting it back on at night just to keep it a little warmer. Hopefully that will help solve this issue and prevent it from getting worse. 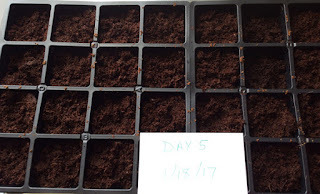 I am now at Day 5 of starting these seeds and hoping it works. I'll be disappointed if in a few days I don't begin to see something. The soil does seem plenty moist so I think that is all good. I'm just concerned about seeing the fungus in a couple of places. The fungus I see isn't a big spot or covering much at all, but seeing a little makes me overly cautious. Where there is some, most likely there will be more. The above image has a yellow arrow indicating what I am referring to with the fungus. The temperature has been between 70 and 76 degrees most of the time. 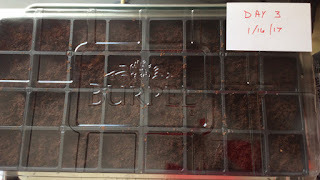 The seed tray is sitting next to the window so it should be getting plenty of light. Below are the pictures. 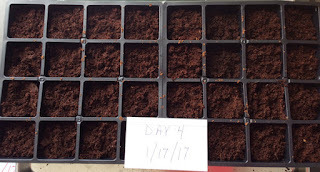 Of course, there are no seedlings up yet, but I am taking pictures each day to document the progress. This way I can look back in the future and see what was happening. This website is a journal in many ways. Keep checking back for more updates. 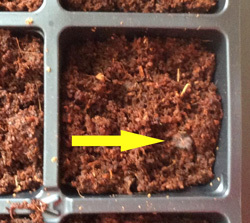 I'm crossing my fingers that in a few more days, I will be seeing seedlings emerge. Grow tomatoes grow!